This is a really simple recipe that a friend of mine suggested. Only, I had to improvise somewhat since I didn’t have all the necessary ingredients. The result? Phenomenal! Enjoy! 1. Clean chicken thoroughly and pat dry. 3. To prepare the rub: in a small bowl, add 1-2 tbs of oil, 1 tbsp dried thyme, 1 tsp of salt (or to taste), 1/2 tsp black pepper, 1/2 tsp cumin, and 1/2 tsp of chilli powder. 4. Prepare the garlic by finely dicing it, or blending it in a food processor. Add to bowl and mix all ingredients well. 5. Slit the chicken in various places to allow for the rub to blend into the chicken whilst cooking. 6. Massage the rub all over the chicken including inside the cavity. 7. Wash and cut a lemon and place 1/2 into cavity. 8. Put some foil over a baking tray and place chicken on tray. No need to cover it. 9. Roast for 1 and 1/2 hrs to 2 hours depending on how powerful your oven is. The trick is to rotate the chicken every 15 minutes to allow for even browning. Before removing from the oven, check to see if the chicken is cooked. It should be moist and not dry. 10. Wash and drain the fingerling potatoes. Do not peel. 11. 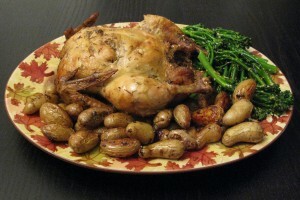 20 minutes prior to removing the chicken from the heat, add the fingerling potatoes. No need to season as they will roast in the juices from the chicken. 12. 5 minutes prior to removing the chicken from the oven, prepare the baby broccoli. 13. In a fry pan, heat up 1-2 tsps of oil. Add 1 tsp of sesame seeds and fry for 1-2 minutes until they turn golden. Do not burn. Add the broccoli (make sure you drained them first) and a sprinkle of salt. Stir-fry for 3-4 minutes only and then remove from pan. Simple, healthy and without too much fuss, this dish is sure to impress! Recipe jointly submitted by Linda Lai & Sabina Huq.